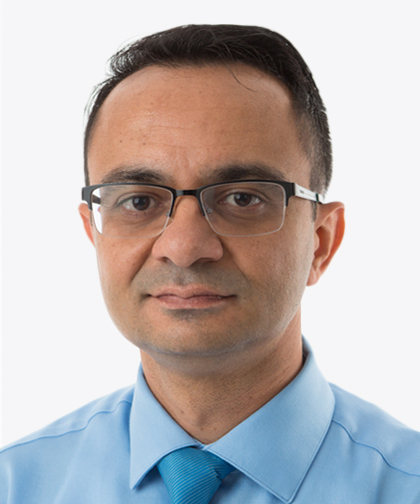 Deep Sharma, MD, MB, BS, is the Medical Director, Unit 4 Dialysis and Assistant Program Director, Fellowship Program in Nephrology at Montefiore. He is also an Assistant Professor of Medicine at our Albert Einstein College of Medicine. Since joining the Montefiore team in 2012, his clinical focus has been on general nephrology and working towards a Renal Stone Program with the Division of Urology. Dr. Sharma attended the University College of Medical Sciences in Delhi, India where he received his Bachelor of Medicine and Bachelor of Science in 2003. He began his postgraduate training in 2006 with an internship, followed by a residency at Good Samaritan Hospital, which he completed in 2009. He then completed a fellowship in Nephrology at Montefiore in 2012. Following his clinical focus, Dr. Sharma also performs nephrology research. He was Co-Principal Investigator of the ASCEND Trial, which studied the treatment of anemia with the drug daprodustat in chronic in patients with chronic kidney disease and end-stage renal disease. His work has been published in numerous reviewed journals and abstracts. Dr. Sharma is a reviewer of Nephrology articles in BioMed Central. Dr. Sharma is board certified by the American Board of Internal Medicine, and a member of the American Society of Nephrology.